Hombu Dojo. 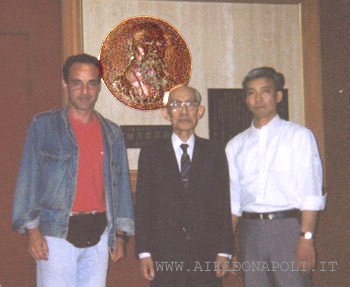 Near the effigy of Founder Morihei Ueshiba, his son Kisshomaru, 2nd Doshu dead in 1999, his grandson, current 3rd Doshu, Moriteru Ueshiba and Master Aldo Varchetta. The art form of the discipline Aikido is personal defense, but, it is also an sublime art form. The exercises associated with Aikido strengthen both body and mind. Morihei Ueshiba, the founder of Aikido, said that "Aikido is the study of the Spirit". However, this is subjective. There are different point of view in masters' opinion. Aikido is just a tool: all the rest depends on the sensitivity of the person who practice it. Following the teachings of the founder Morihei Ueshiba, my goal is to propose, "Peace and Love" through Aikido. "Love thy neighbour"; I believe that this very powerful Biblical phrase marries well with the philosophy underpinning Aikido. At a seminar in which I had the honour of participating, Master Hideo Hirosawa, one of the last students of O’ Sensei the founder, would often repeat, “cleanse the spirit”. It is true, only through cleansing, even through continued training in Aikido, that man’s spirit becomes pure. Given that man’s ultimate goal is to achieve goodness for its own sake we can assume that the spirit becomes elevated. The more elevated the spirit is, the more the Aikido that a person expresses thus acquiring a higher value. He enters in the subtle realm of perceptions increasing his internal strength without either seeking competition or coarseness. Therefore, self-analysis, gratitude, respect for oneself and for others, not being critical of others and recognizing our own defects, and being able to forgive, allow our fears and our egos to give way to a pure heart; to Aikido. That is, it allows us to return to the ‘Divine’ that exists in each of us, in our being; not many personalities but rather the unity with the true self. Rediscovering humility, this is what Aikido is for me. Therefore, begin to work on yourself. Inquisitiveness for the art of movement has driven him since 1984 to participate in courses of Aikido and to train to the present moment. Aldo Varchetta, born in Pozzuoli (Naples) in 1955; he has been student of Master Agostino Pagano 6th Dan and he participated in more than 150 training workshops at international level. To gain deeper knowledge, in 1993 he went to Tokyo to study at the Hombu Dojo, international centre for Aikikai and to Iwama to pay homage to the memory of the Founder. 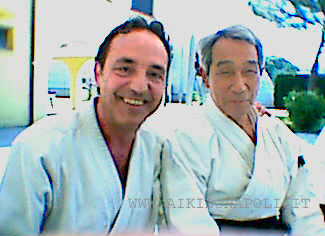 Afterwards, he went to Gessoji Dojo of Master Hiroshi Tada C.N. 9th Dan, who founded this discipline in Italy. Over the years, he has enriched his cultural training through experiences in the disciplines for the development of knowledge and the synergy of body, mind and spirit. For more information consult the Master's curriculum. Via Lago Patria, 180 -Lago Patria - Giugliano (Napoli).